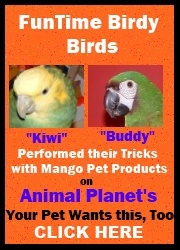 The Place to be for Fun for your Bird!! Parrots are naturally and instinctively playful in nature. Imagine a play area for your Feathered Friend where their bird toys are at Eye Level and not hanging below them to be pooped on and a play area which is easily transported to each room of your home. Our PVC Stands have been specifically designed so that the lip of our Tabletop Playgym fits snuggly and securely onto the top of the Sturdy PVC Play Stand. Our Tabletop Playgym can just pop right off (no tools required) and still be carried from room to room without the stand. Check out our video below in the "See This Product in Action" section to see how lightweight and easy to move our playgym is. Our Activity Center Playgym is specifically designed to allow birds to have toys at eye level.